For the 1955 Italian comedy film, see A Hero of Our Times. For the album by Satanic Surfers, see Hero of Our Time. 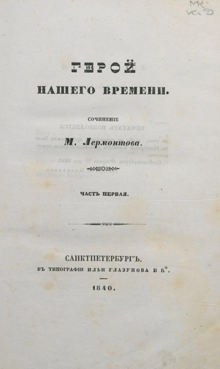 A Hero of Our Time (Russian: Герой нашего времени, Geróy náshevo vrémeni) is a novel by Mikhail Lermontov, written in 1839, published in 1840, and revised in 1841. Pechorin is the embodiment of the Byronic hero. Byron’s works were of international repute and Lermontov mentions his name several times throughout the novel. According to the Byronic tradition, Pechorin is a character of contradiction. He is both sensitive and cynical. He is possessed of extreme arrogance, yet has a deep insight into his own character and epitomizes the melancholy of the romantic hero who broods on the futility of existence and the certainty of death. Pechorin’s whole philosophy concerning existence is oriented towards the nihilistic, creating in him somewhat of a distanced, alienated personality. * The name Pechorin is drawn from that of the Pechora River, in the far north, as a homage to Aleksandr Pushkin's Eugene Onegin, named after the Onega River. Pechorin's chronologically last adventure, was first described in the book, showing the events that explain his upcoming fall into depression and retreat from society, resulting in his self-predicted death. The narrator is Maxim Maximytch telling the story of a beautiful Circassian princess 'Bela', whom Azamat abducts for Pechorin in exchange for Kazbich's horse. Maxim describes Pechorin's exemplary persistence to convince Bela to give herself sexually to him, in which she with time reciprocates. After living with Bela for some time, Pechorin starts explicating his need for freedom, which Bela starts noticing, fearing he might leave her. Though Bela is completely devoted to Pechorin, she says she's not his slave, rather a daughter of a Circassian tribal Chieftain, also showing the intention of leaving if he 'doesn't love her'. Maxim's sympathy for Bela makes him question Pechorin's intentions. Pechorin admits he loves her and is ready to die for her, but 'he has a restless fancy and insatiable heart, and that his life is emptier day by day'. He thinks his only remedy is to travel, to keep his spirit alive. However Pechorin's behavior soon changes after Bela gets kidnapped by his enemy Kazbich, and becomes mortally wounded. After 2 days of suffering in delirium Bela spoke of her inner fears and her feelings for Pechorin, who listened without once leaving her side. After her death, Pechorin becomes physically ill, loses weight and becomes unsociable. After meeting with Maxim again, he acts coldly and antisocial, explicating deep depression and disinterest in interaction. He soon dies on his way back from Persia, admitting before that he is sure to never return. Pechorin described his own personality as self-destructive, admitting he himself doesn't understand his purpose in the world of men. His boredom with life, feeling of emptiness, forces him to indulge in all possible pleasures and experiences, which soon, cause the downfall of those closest to him. He starts to realize this with Vera and Grushnitsky, while the tragedy with Bela soon leads to his complete emotional collapse. His crushed spirit after this and after the duel with Grushnitsky can be interpreted that he is not the detached character that he makes himself out to be. Rather, it shows that he suffers from his actions. Yet many of his actions are described both by himself and appear to the reader to be arbitrary. Yet this is strange as Pechorin's intelligence is very high (typical of a Byronic hero). Pechorin's explanation as to why his actions are arbitrary can be found in the last chapter where he speculates about fate. He sees his arbitrary behaviour not as being a subconscious reflex to past moments in his life but rather as fate. Pechorin grows dissatisfied with his life as each of his arbitrary actions lead him through more emotional suffering which he represses from the view of others. Albert Camus' novel The Fall begins with an excerpt from Lermontov's foreword to A Hero of Our Time: "Some were dreadfully insulted, and quite seriously, to have held up as a model such an immoral character as A Hero of Our Time; others shrewdly noticed that the author had portrayed himself and his acquaintances. A Hero of Our Time, gentlemen, is in fact a portrait, but not of an individual; it is the aggregate of the vices of our whole generation in their fullest expression." In Ian Fleming's From Russia with Love the plot revolves upon Soviet agent Tatiana Romanova feigning an infatuation with MI6's James Bond and offering to defect to the West provided he'll be sent to pick her up in Istanbul, Turkey. The Soviets elaborate a complex backstory about how she spotted the file about the English spy during her clerical work at SMERSH headquarters and became smitten with him, making her state that his picture made her think of Lermontov's Pechorin. 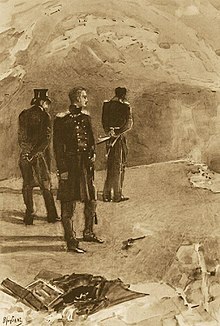 The fact that Pechorin was all but a 'hero' or even a positive character at all in Lermontov's narration stands to indicate Fleming's wry self-deprecating wit about his most famous creation; the irony is lost, however, on western readers not familiar with Lermontov's work. In Ingmar Bergman's film The Silence, the young son is seen reading the book in bed. In the opening sequence of Bergman's next film Persona the same child actor is seen waking in what appears to be a mortuary and reaching for the same book. Claude Sautet's film A Heart in Winter (Un Coeur en Hiver) was said to be based on "his memories of" the Princess Mary section. The relationship with Lermontov's work is quite loose – the film takes place in contemporary Paris, where a young violin repairer (played by Daniel Auteuil) seeks to seduce his business partner’s girlfriend, a gifted violinist named Camille, into falling for his carefully contrived charms. He does this purely for the satisfaction of gaining control of her emotionally, while never loving her sincerely. He is a modern-day Pechorin. "My whole life has been merely a succession of miserable and unsuccessful denials of feelings or reason." "...I am not capable of close friendship: of two close friends, one is always the slave of the other, although frequently neither of them will admit it. I cannot be a slave, and to command in such circumstances is a tiresome business, because one must deceive at the same time." "Afraid of being judged, I buried my finer feelings in the depths of my heart and they died there." "It is difficult to convince women of something; one must lead them to believe that they have convinced themselves." "What of it? If I die, I die. It will be no great loss to the world, and I am thoroughly bored with life. I am like a man yawning at a ball; the only reason he does not go home to bed is that his carriage has not arrived yet." "When I think of imminent and possible death, I think only of myself; some do not even do that. Friends, who will forget me tomorrow, or, worse still, who will weave God knows what fantastic yarns about me; and women, who in the embrace of another man will laugh at me in order that he might not be jealous of the departed—what do I care for them?" "Women! Women! Who will understand them? Their smiles contradict their glances, their words promise and lure, while the sound of their voices drives us away. One minute they comprehend and divine our most secret thoughts, and the next, they do not understand the clearest hints." "There are two men within me – one lives in the full sense of the word, the other reflects and judges him. In an hour's time the first may be leaving you and the world for ever, and the second? ... the second? ..."
"To cause another person suffering or joy, having no right to so—isn't that the sweetest food of our pride? What is happiness but gratified pride?" "I'll hazard my life, even my honor, twenty times, but I will not sell my freedom. Why do I value it so much? What am I preparing myself for? What do I expect from the future? in fact, nothing at all." "Passions are merely ideas in their initial stage." "I was prepared to love the whole world . . . I learned to hate." "Whether I am a fool or a villain I know not; but this is certain, I am also most deserving of pity – perhaps more so than she. My soul has been spoiled by the world, my imagination is unquiet, my heart insatiate. To me everything is of little moment. I have become as easily accustomed to grief as to joy, and my life grows emptier day by day." "That is just like human beings! They are all alike; though fully aware in advance of all the evil aspects of a deed, they aid and abet and even give their approbation to it when they see there is no other way out—and then they wash their hands of it and turn away with disapproval from him who dared assume the full burden of responsibility. They are all alike, even the kindest and wisest of them!" "Women love only the men they don't know." In 2011 Alex Mcsweeney adapted the novel into an English-language playscript. Previewed at the International Youth Arts Festival in Kingston upon Thames, Surrey, UK in July, it subsequently premiered in August of the same year at Zoo Venues in the Edinburgh Fringe Festival. Critics received it positively, generally giving 4- and 5-star reviews. In 2014, German stage director Kateryna Sokolova adapted the novel focusing on its longest novella, Princess Mary. The play, directed by Kateryna Sokolova, premiered at the Schauspielhaus Zürich on 28 May. The production received universal acclaim, especially praising it for not having lost "neither the linguistic finesse nor the social paralysis of Lermontov’s Zeitgeist", both of which constitute the novel’s Byronic character. On July 22, 2015, The Bolshoi Theatre in Moscow premiered a ballet adaptation of "Hero of Our Time". The ballet was choreographed by San Francisco Ballet's Choreographer in Residence, Yuri Possokhov, and directed by Kirill Serebrennikov - who is also the author of the libretto. The score was commissioned purposefully for this production and composed by Ilya Demutsky. This production focuses on three novellas from Lermontov's novel - Bela, Taman, and Princess Mary. Sketches of Russian life in the Caucasus. By a Russe, many years resident amongst the various mountain tribes. London, Ingram, Cook and Co., 1853. 315 pp. "The illustrated family novelist" series, #2. (a liberal translation with changed names of the heroes; "Taman" not translated). The hero of our days. Transl. by Theresa Pulszky. London, T. Hodgson, 1854. 232 pp. "The Parlour Library". Vol.112. ("Fatalist" not translated). A hero of our own times. Now first transl. into English. London, Bogue, 1854. 231 pp., ill. (the first full translation of the novel by an anonymous translator). A hero of our time. Transl. by R.I. Lipmann. London, Ward and Downey, 1886. XXVIII, 272 pp. ("Fatalist" not translated). Taman. In: Tales from the Russian. Dubrovsky by Pushkin. New year's eve by Gregorowitch. Taman by Lermontoff. London, The Railway and general automatic library, 1891, pp. 229–251. Maxim Maximich. — In: Wiener L. Anthology of Russian literature. T. 2, part 2. London—N.Y., 1903, pp. 157–164. (a reduced version of the "Maxim Maximich" chapter). The heart of a Russian. Transl. by J.H. Wisdom and Marr Murray. London, Herbert and Daniel, 1912. VII, 335 pp. (also published in 1916 by Hodder and Stoughton, London—N.Y.—Toronto). The duel. Excerpt from The hero of our own time. Transl. by T. Pulszky. — In: A Russian anthology in English. Ed. by C.E.B. Roberts. N. Y., 1917, pp. 124–137. A traveling episode. — In: Little Russian masterpieces. Transl. by Z.A. Ragozin. Vol. 1. N.Y., Putnam, 1920, pp. 165–198. (an excerpt from the novel). A hero of nowadays. Transl. by John Swinnerton Phillimore. London, Nelson, 1924. Taman'. — In: Chamot A. Selected Russian short stories. Transl. by A.E. Chamot. London, 1925—1928, pp. 84—97. A hero of our time. Transl. by Reginald Merton. Mirsky. London, Allan, 1928. 247 pp. Fatalist. Story. Transl. by G.A. Miloradowitch. — In: Golden Book Magazine. Vol. 8. N.Y., 1928, pp. 491—493. A hero of our own times. Transl. by Eden and Cedar Paul for the Lermontov centenary. London, Allen and Unwin, 1940. 283 pp. (also published by Oxford Univ. Press, London—N.Y., 1958). Bela. Transl. by Z. Shoenberg and J. Domb. London, Harrap, 1945. 124 pp. (a dual language edition). A hero of our time. Transl. by Martin Parker. Moscow, Foreign languages publ. house, 1947. 224 pp., ill. (republished in 1951 and 1956; also published by Collet's Holdings, London, 1957). A hero of our time. A novel. Transl. by Vladimir Nabokov in collab. with Dmitri Nabokov. Garden City, N.Y., Doubleday, 1958. XI, 216 pp. "Doubleday Anchor Books". A Lermontov reader. Ed., transl., and with an introd. by Guy Daniels. New York: Grosset & Dunlap, 1965. A hero of our time. Transl. with an introduction by Paul Foote. Harmondsworth, Middlesex: Penguin Books, 1966. Major poetical works. Transl., with an introduction and commentary by Anatoly Liberman. Minneapolis : University of Minnesota Press, 1983. Vadim. Transl. by Helena Goscilo. Ann Arbor: Ardis Publishers, 1984. A hero of our time. Transl. with an introduction and notes by Natasha Randall; foreword by Neil Labute. New York: Penguin, 2009. A hero of our time. Transl. by Alexander Vassiliev, London: Alexander Vassiliev 2010. (a dual language edition). A hero of our time. Transl. by Nicholas Pasternak Slater, Oxford World’s Classics 2013. ^ Murray, Christopher (2004). Encyclopedia of the Romantic Era, 1760–1850. New York: Taylor & Francis. p. 498. ISBN 1-57958-423-3. ^ "A Hero of Our Time". Kateryna Sokolova. Retrieved 2017-04-07. ^ "Ein Held unserer Zeit | Schauspielhaus Zürich". www.schauspielhaus.ch. Retrieved 2017-04-07. ^ Steiger, Claudio (2014-05-30). "Lermontow-Roman in der Schauspielhaus-Kammer: Nihilismus und Ehre". Neue Zürcher Zeitung (in German). ISSN 0376-6829. Retrieved 2017-04-07. ^ a b "Kurz & kritisch im Mai". Basler Zeitung, Basler Zeitung (in German). 2014-05-30. ISSN 1420-3006. Retrieved 2017-04-07. ^ "Kurz & kritisch im Mai". Tages-Anzeiger, Tages-Anzeiger (in German). 2014-05-30. ISSN 1422-9994. Retrieved 2017-04-07. ^ "Repertoire". Bolshoi.ru. Retrieved 2018-08-29. ^ Based on B.L. Kandel, Bibliography of translations of "A Hero of Our Time" into foreign languages Archived August 27, 2011, at the Wayback Machine (Russian); published in: A Hero of Our Time. Moscow, 1962, pp. 209–210. ^ Translations from Longworth on as cited in COPAC catalogue.